Hands up if you’re a fan of Fluid, the app that turns any web site (or web application) into a standalone application. Yeah, me too. If you’ve been following the screencasts and Twitterings of Fluid developer Todd Ditchendorf, you might have noticed some news floating around; he has now launched his official browser spin-off, Cruz. If you’re confused about the name, don’t worry, you have every right to be. This app was going to be called “Mecca”, but then Todd changed his mind. What was that all about? We started with the name change. “I actually went through several different names for the app, and I was having a hard time settling on one I liked,” Todd explained. “It’s extremely difficult to name software projects, as most of the obvious names are already taken by existing projects –œ and then there’s the difficulty of finding an available domain name. So what is Cruz, exactly? Todd calls it a “social browser”, but what does that mean? Because it’s built with all the goodies that come with Fluid, Cruz includes some very nifty extras that you don’t find in other browsers. With the BrowsaBrowsa feature, you can create mini browsers that lurk to one side of your main browsing window; ideal for search engines or Twitter streams. 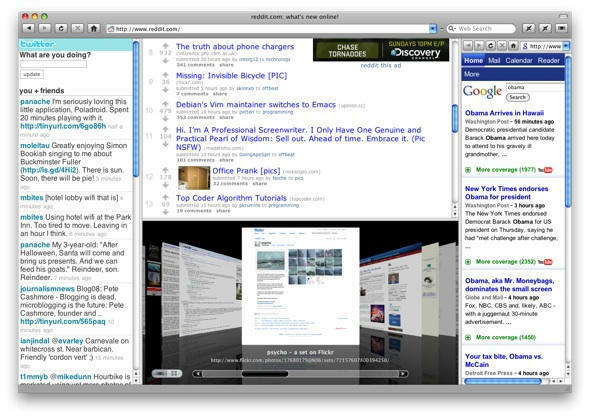 Fluid is also a very good impersonator, and can pretend to be the iPhone browser when visiting sites. Which means you can get the slimmed-down version of Hahlo or Twitter or whatever you enjoy using, but on your desktop. “Unlike Safari, Fluid and Cruz have an open Cocoa plug-in API which allows you to extend the browser’s UI in split views, drawers, and floating panels. The Fluid plug-in sample code has been public for many months, and I’ll be releasing updated sample code in the very near future to show how developers can create plug-ins for Cruz. Obvious uses for the plugin-ins are integrating with Mac OS X native services or accessing remote web services and social networks for display in the browser. “Cruz ships with two plug-ins built-in. The Thumbnail Plug-in allows you to view links or images from any page in a CoverFlow- or iPhoto-like UI. The BrowsaBrowsa Plug-in alows you to place additional web browser views in split panes and drawers attached to the main browser window. “Personally, I use the BrowsaBrowsa Plug-in to view Twitter, FriendFeed, Socialthing, Google Reader, BrightKite, Flickr and other social webapps in split views directly in my browser. So it’s certainly possible to use the existing features of Cruz to produce a more ‘social’ browsing experience. So why make it? What’s the purpose? “Why Cruz? I found that may Fluid users didn’t realize that a Fluid SSB is actually a very full-featured browser, and that it’s easy to use an SSB as such. By releasing Cruz, I’m lowering the conceptual barrier to entry, and making it clear that Cruz is a capable standalone web browser. It’s not intended to be a money-making exercise, though. “Cruz will always remain freeware. My current goal with Cruz is just to have fun. To have fun developing it, sharing it, and using it. Browsing should fun. “I like the idea of a native Mac OS X browser with a Cocoa plug-in API. The plug-in API allows you to explore all kinds of crazy, wild, exciting ideas that perhaps the larger browser vendors might not want to focus on. There are infinite ways in which a browser’s UI could be extended to integrate new ideas and services… and Cruz is an attempt to offer that kind of foundation/platform. “As for measuring success … I’m not taking this project too seriously. I’m certainly not aiming to gain any kind of significant market share with Cruz, but rather to explore ideas. If some of those ideas should be deemed interesting and be incorporated into other browsers, I would consider that a success. So there you go, folks, another browser to add to your collection. Let us know what you think of it.